Volume 29 of the Gabriel Wells Definitive Edition of Mark Twain's works is Europe and Elsewhere, a collection of 35 essays, sketches and travel letters from both previously published and unpublished material. 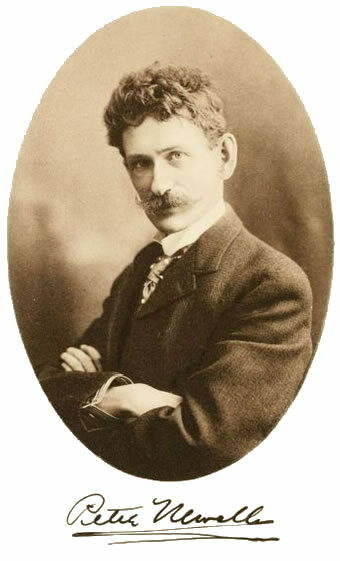 The collection was assembled (and in some cases edited) by Mark Twain's literary executor Albert Bigelow Paine. Printing codes for the book indicate Harper and Brothers printed it in May 1923 and copyrighted the volume in August 1923. It was first issued in Harper's Uniform Library Edition with red cloth and gold cornstalk bindings. 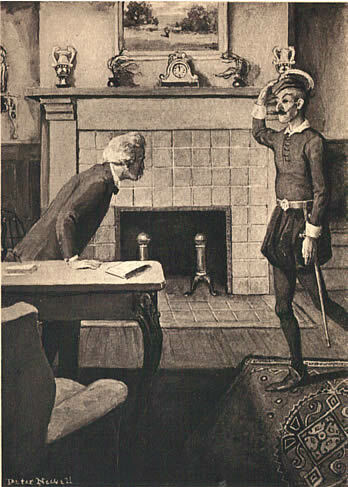 The first edition features a full page frontispiece illustration by Peter Newell and "An Appreciation" by Brander Matthews which was actually a reprint of the "Biographical Criticism" that had appeared in Volume 1 of the 1899 uniform edition of Mark Twain's Works issued by American Publishing Company. The first edition of Europe and Elsewhere also contains an introduction by Albert Bigelow Paine. The arrangement of the first edition is the same type of arrangement used for other volumes in the Gabriel Wells Definitive Edition and suggests that the first edition of Europe and Elsewhere was prepared concurrently with the Gabriel Wells Definitive Edition. A NUMBER of articles in this volume, even the more important, have not heretofore appeared in print. Mark Twain was nearly always writing -- busily trying to keep up with his imagination and enthusiasm: A good many of his literary undertakings remained unfinished or were held for further consideration, in time to be quite forgotten. Few of these papers were unimportant, and a fresh interest attaches to them to-day in the fact that they present some new detail of the author's devious wanderings, some new point of observation, some hitherto unexpressed angle of his indefatigable thought. The present collection opens with a chapter from a book that was never written, a book about England, for which the author made some preparation, during his first visit to that country, in 1872. He filled several notebooks with brief comments, among which appears this single complete episode, the description of a visit to Westminster Abbey by night. As an example of what the book might have been we may be sorry that it went no farther. I came here to take notes for a book, but I haven't done much but attend dinners and make speeches. I have had a jolly good time, and I do hate to go away from these English folks; they make a stranger feel entirely at home, and they laugh so easily that it is a comfort to make after-dinner speeches here. England at this time gave Mark Twain an even fuller appreciation than he had thus far received in his own country. To hunt out and hold up to ridicule the foibles of hosts so hospitable would have been quite foreign to his nature. The notes he made had little satire in them, being mainly memoranda of the moment. . . .
"Down the Rhône," written some twenty years later, is a chapter from another book that failed of completion. Mark Twain, in Europe partly for his health, partly for financial reasons, had agreed to write six letters for the New York Sun, two of which -- those from Aix and Marienbad -- appear in this volume. Six letters would not make a book of sufficient size and he thought he might supplement them by making a drifting trip down the Rhône, the "river of angels," as Stevenson called it, and turning it into literature. The trip itself proved to be one of the most delightful excursions of his life, and his account of it, so far as completed, has interest and charm. But he was alone, with only his boatman (the "Admiral") and his courier, Joseph Very, for company, a monotony of human material that was not inspiring. He made some attempt to introduce fictitious characters, but presently gave up the idea. As a whole the excursion was too drowsy and comfortable to stir him to continuous effort; neither the notes nor the article, attempted somewhat later, ever came to conclusion. Things have reached the point where, if Mark Twain is not at a public meeting or banquet, he is expected to console it with one of his inimitable letters of advice and encouragement. His old friend, W. D. Howells, expressed an amused fear that Mark Twain's countrymen, who in former years had expected him to be merely a humorist, should now, in the light of his wider acceptance abroad, demand that he be mainly serious. I bring you the stately nation named Christendom, returning, bedraggled, besmirched, and dishonored, from pirate raids in Kiao-Chau, Manchuria, South Africa, and the Philippines, with her soul full of meanness, her pocket full of boodle, and her mouth full of pious hypocracies. Give her soap and a towel, but hide the looking-glass. How gratifying it is to feel that we have a man among us who understands the rarity of plain truth, and who delights to utter it, and has the gift of doing so without cant, and with not too much seriousness. The principals of the primal human drama, our biblical parents of Eden, play a considerable part in Mark Twain's imaginative writings. He wrote "Diaries" of both Adam and Eve, that of the latter being among his choicest works. He was generally planning something that would include one or both of the traditional ancestors, and results of this tendency express themselves in the present volume. Satan, likewise, the picturesque angel of rebellion and defeat, the Satan of Paradise Lost, made a strong appeal and in no less than three of the articles which follow the prince of error variously appears. For the most part these inventions offer an aspect of humor; but again the figure of the outcast angel is presented to us in an attitude of sorrowful kinship with the great human tragedy. The first edition of Europe and Elsewhere features a frontispiece illustration by Peter S. Newell (b. 1862 - d. 1924) for the essay "Sold to Satan." The Gabriel Wells Definitive Edition features this same frontispiece plus three additional full-page illustrations. Two are signed by Newell and the third is likely his work as well. No previous publications of Newell's illustrations in Europe and Elsewhere have been found. Newell had illustrated a number of Mark Twain's texts prior to Europe and Elsewhere. In 1897 he contributed illustrations to the first edition of Following the Equator from American Publishing Company. In 1899 he provided illustrations for the American Publishing Company's uniform edition of The Innocents Abroad. 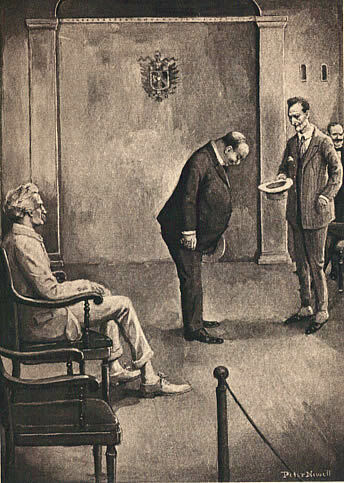 When Mark Twain's "The $30,000 Bequest" was originally published as a short story in Harper's Weekly, December 10, 1904 it featured illustrations by Peter Newell. Volume 24 of the Gabriel Wells Edition features one of Newell's original illustrations for "The $30,000 Bequest." Some of Newell's illustrations for Europe and Elsewhere feature characters who bear a striking resemblance to his own appearance. 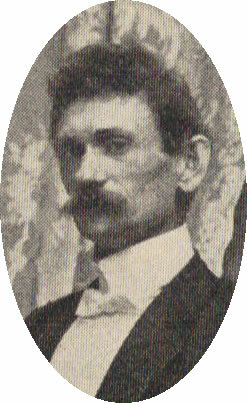 1905 photo of Peter Newell from Mark Twain's seventieth birthday celebration held 5 December 1905. Newell's f rontispiece for Europe and Elsewhere featuring Mark Twain meeting the character Satan who resembles Newell himself. In addition to Newell's illustrations, Europe and Elsewhere also features nine humorous illustrations by Mark Twain to accompany his essay "Instructions in Art" which are embedded within the text of the essay and not listed in the illustrations list. Mark Twain's 70th Birthday: Souvenir of its Celebration. Supplement to Harper's Weekly, 23 December 1905.